We’ve all heard people complain about it – “reverse racism” – but does such a phenomena actually exist? 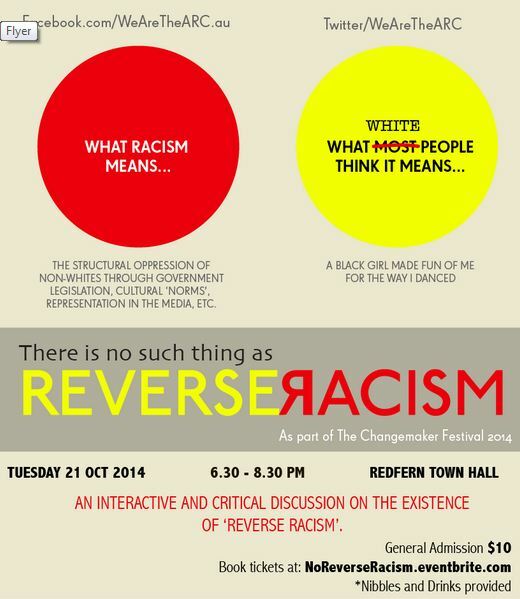 In case you are wondering, reverse racism refers to the discrimination against the dominant racial group in a society. Here our panel will discuss why reverse racism has no place in society, and how calling out reverse racism could actually be damaging towards the fight against ‘actual’ racism. Feel free to disagree with us. This will largely be an interactive event – so bring your questions and lets have a discussion. Gary Paramanathan is an arts and cultural worker based in Western Sydney. Gary works for Information and Cultural Exchange (ICE) as the Screen Cultures Producer. He has collaborated with a number of arts and diversity related organisations. Gary is the founder and director Colourfest Film Festival (founded 2010) and is passionate about non-white representation and identity in the media. Saman Shad is a playwright, storyteller and a freelance writer for the Guardian, SBS and Fairfax. Her plays have been performed across theatres in London including the Soho and Hampstead theatre. She was a scriptwriter for a BBC radio drama series for five years. She has a particular interest in race relations and giving a voice to the disenfranchised. Luke Pearson is a Gamilaroi man and the creator of IndigenousX. Luke is a qualified teacher, a prominent public speaker and trainer, and an active social commentator. Luke is currently living in Sydney and working fulltime on IndigenousX and number of side projects, including ARC. Suzanne Nguyen is a story collector and artist, she founded The Two Chairs as a way of using creative conversation to openly discuss race and racism. Currently, she is compelled to explore the intersection of community and digital media to create positive social change and diversity. >> REGISTER for this event!